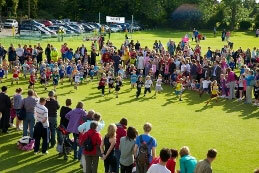 The Tring Midsummer Fun Run, organised by Tring Running Club, is held in June each year. There are runs, medals and trophies for all ages, from pre-school up to adults. Funds raised by the event benefit local charities, including Rennie Grove Hospice Care and Chilterns MS Centre.